Ironic headline in today’s The Province out of Vancouver, BC. Yes, indeed. “Thinks” are going to get a lot more worster. I awoke this morning to this article by Zoe Williams in The Guardian (“On the spectrum of deceit, ministers have gone off the scale“) about the degeneration of political speech and practice in the UK. And although her focus is “post-truth politics” and the democratic deficit there, it seems to be the trend everywhere, including here in Canada where a “culture of lying” has become pretty much entrenched in political speech and practice. What Williams calls “post-truth politics” is what I have been calling “post-Enlightenment” or “death of God” politics. Let’s say that “Truth” is another one of those higher values being ground down by the dynamics of our “two centuries of nihilism”, as Nietzsche forecast it. Is this tendency simply, as Rosenstock-Huessy suggested, a case of cowardice and a general failure of nerve? Another aspect of what Christopher Lasch once called “the culture of narcissism”? We are living through Nietzsche’s anticipated “two centuries of nihilism”; a time in which “all higher values devalue themselves”, as he gave as his succinct definition of nihilism. Gold transmuted into lead; the noble degraded into the ignoble — refinement become confused with reductionism, which confusion of values is itself an example of the process of nihilism. Still, despite his anticipation of unprecedented tragedies and degradations, Nietzsche managed to remain cheerfully confident that the human race would emerge on the other side of the crucible transformed and transfigured by the experience. Beware the suits. 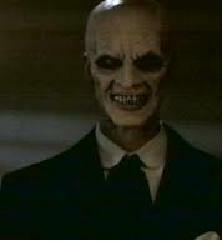 (Actually, I couldn’t find a good picture of the Bogeyman, but this self-portrait in suit will do). America — What’s in a Name? Reading up today on the controversy surrounding the revelations made by Edward Snowden concerning the NSA “total” surveillance system, I came across Glenn Greenwald’s article questioning the espionage charges being brought against Mr. Snowden for causing “injury to America”. Greenwald responds with the sensible question: who actually is causing “injury to America”? “Greed is good”, croons Gordon Gekko in Oliver Stone’s movie Wall Street. Stone was later surprised to discover that his anti-hero, Gekko (an allusion to a reptile by that name), is actually worshiped as a hero on Wall Street. Is greed “good”? Are the greedy reptiles, in the sense of being an atrophied or retrograde form?